Material gathered by Victoria Business School students through interviews with 113 businesses forms the basis of a major new report. Material gathered by Victoria Business School students through interviews with 113 businesses forms the basis of a major new report looking at the strengths, challenges and opportunities of Wellington’s knowledge economy. In 2013, as part of a strategic human resources paper taught by Dr Richard Norman, senior lecturer in the School of Management, students surveyed companies in sectors such as telecommunications, digital media, finance and insurance, food and beverage and manufacturing to understand the issues they were facing and the pros and cons of being based in Wellington. The information they gathered has fed into the Working Capital project, which has support from the Wellington Regional Strategy and Grow Wellington and is focused on the skills, employment and training issues crucial to the future prosperity of the Wellington region. Students studying strategic human resources with Dr Norman this year are surveying 50 companies which specialise in computing, software and communications, seeking more depth information about the human resources challenges of this growing sector of Wellington’s economy. 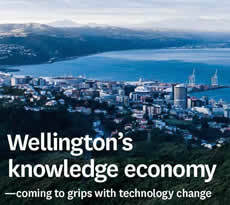 The project’s first report, Wellington’s Knowledge Economy: Coming to grips with technology change, was compiled by Dr Norman and independent research consultant Judy Oakden.